Graduating from Bates in May of 1984 was not the end for Jim Sylvia, a four-time letter winner for the baseball team and a proud member of the Bobcat community for four years. While some of his classmates haven’t even been back to Lewiston since graduation, Sylvia became an active member of the alumni community right from the start. He frequently returns to campus, attends events, and has gotten involved in a project to provide a turf baseball field to the program. In fact, Mr. Sylvia’s son, Will, is a current member of the baseball team and the Bates Class of 2020. Jim Sylvia’s baseball career at Bates was definitely one to remember. He still holds the single-season and career records for walks, his team led the nation in batting average during his senior season, and during his career they made two appearances in the four-team ECAC Tournament (there was no NESCAC Tournament at the time). After such a successful career, his class was not ready to leave just yet. For years after they graduated a good number of alumni would return every year and play an exhibition game against the current team after the conclusion of their season. Naturally, ties with Bates couldn’t just end once these exhibition games stopped happening. 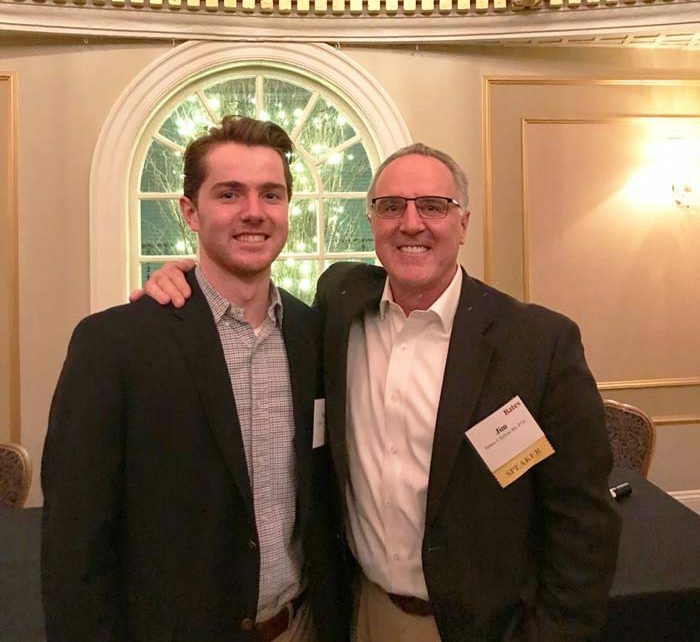 Once Will started at Bates and Mr. Sylvia began regularly attending games again whenever he could and it was at this point when he saw what was going on around the NESCAC. With teams like Colby, Trinity, and Hamilton putting in brand new turf baseball fields, Bates is left behind, often not able to play home games until the second week of April. This puts Bates at a significant recruiting disadvantage and is frankly embarrassing at times when Coach Martin is forced to scramble for a field to play on, often settling to play at Colby–one of our rival schools. This was when Mr. Sylvia decided it was time to step in. Together with the help of the athletic department and an outside company, Sylvia created a design. He and the Director of Athletics Jason Fein pitched the idea to a group of parents and players during a program dinner on the spring trip in Florida. Now the plan is set for a new turf baseball field right on Leahey Field and the fundraising has begun. With as much history as there is on Leahey Field, it will be very difficult to see it go when the time comes. However, Jim Sylvia is fully dedicated to providing Bates Baseball with every resource he has. He recognized that this is what the program needs and he set his sights on making it happen. No matter when this project gets done, it won’t be the end for the Sylvia family. Mr. Sylvia will be right beside the program for as long as he can and Will is going to be there after him. Jim Sylvia has done everything he can for Bates College and he embodies all of the best values that the college has to offer.